One way of falling in love with China is first to fall in love with a Chinese woman. That is how it happened to Englishman Joseph Needham. It can happen in reverse order as well. Neither method is requisite, and one can fall in love with one without the other. It is not likely that many will emulate to romance of Needham with China, or with the woman who introduced him to her country, Gwei-djen. This is not a story of a very commonplace love affair, or a very commonplace lover, either. 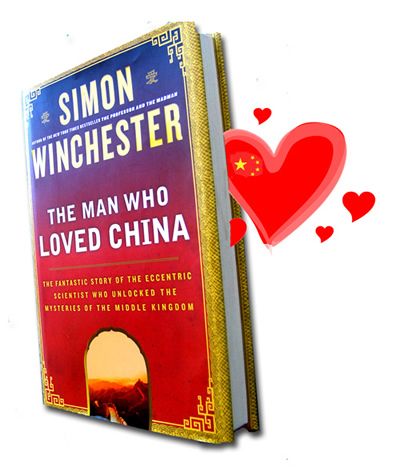 Mostly it is about Needham’s love affair with China, and not because the Chinese woman in this case, a brilliant young biochemist from Nanjing whowas Needham’s mistress in a open marriage he maintained with his compliant wide, Dorothy, also a highly-regarded scientist. Needham himself was a renowned chemist possessed with a spongy mind and near photographic memory that allowed him to soak up languages (French, German, Latin and Greek, in addition to Chinese) as well as huge chunks of scientific and technological information. He was also a zealous socialist, a nudist, Morris dancer and a bit of a womanizer. Intellectual brilliance not only often comes with such eccentricities, but also often exonerates them. It is the hunger Needham had for facts and information about China’s scientific and technological past that took him there in a somewhat vague “diplomatic” capacity in the years just before the revolution when he was attached to the British embassy in Chongqing as head of a new body called the Sino-British Scientific Cooperation Office. If that doesn’t sound like a MI-6 cover John LeCarre is a Harlequin Romance author. Needham did meet Ma and became quite friendly with Zhou en-lai. In his later years hid did get in a bit of a political tangle that proved diplomacy was not among his many gifts. But in his China years Needham seemed too busy with his quest to spy all that much. His obsession and mission was to try to keep Chinese scientists working with modern equipment, which he was instrumental in supplying to universities and laboratories, and in collecting any and all information about Chinese scientific and technological achievement for what would eventually become, under mostly his authorship the most complete encyclopedic record of it in existence. He sent tons of information back to Cambridge for later fodder for his multi-volumemagnus opus, Science and Civilization in China. Needham believed that the West did not fully appreciate the extent of Chinese scientific and technological contributions over its long history and that, indeed, some of China’s achievements had been appropriated by the West. In dozen page appendix to this book listing China’s discoveries and inventions there are some surprises for those of us who have been brought up in the Eurocentric historical tradition. That tradition gives the Chinese credit for gunpowder (9th C AD), paper (300 BC), kites (4th C AD) and the spinning of silk (2850 BC), but there are numerous other inventions and discoveries that Needham’s intrepid research and travels have brought to light. A brief, but relevant detour. My own Chinese friends like to take credit for the invention of noodles (supposedly, in China in AD 100), but I argue that it was the Roman navy who invented dried noodles—pasta—before that time as a means for keeping weevils and other bugs away from the grains aboard their ships. Moreover, Chinese noodles are of a different composition and so are perhaps a different “species” of noodles. More important to my (obvious) prejudice in this matter is that I have no quibble with the Chinese cooking their noodles to the smushy consistency of worms, but it is a crime to cook fettuccini or penne to any consistency less thanal dente. I won’t stand for it, you hear! Bu ha˘o! bu ha˘o! Needham ever really came up with much of an answer to the big question. There is no argument that the Chinese long ago developed a curiosity and intelligence that resulted in many discoveries and inventions. One explanation for their achievements is that they have been around so long and they have been very cohesive in culture and language over a very long period of time. Factors that might have held back advancement—the way that religion obstructed stem cell research in America, for example—were present at various times in China, and Emperor Qin Shi Huang had a penchant for killing scholars, but the Chinese were numerous and emperors were often reclusive and left the people alone if they were not too Troublesome. Still, the impressive record makes us wonder why China came to be regarded as a backward nation in modern times. Was it the Qing Dynasty? Was it Confucianism? Was it the rigidities and stupidities of Maoism? Or, Did China, as some observers wearily conclude, “just stop trying”? Maybe they went into a sort of Luddite period, or even seriously began to wonder about the “costs” that “progress” exacts. If that were the case it would be ironic that we are now in what is the Post-Mao/Pro Pro-Deng (“to get rich is glorious”) period in China, and there is a growing awareness that the massive production and consumption of a huge society with pent up wants and needs already has a big and powerful head of steam. China cannot simply adopt the West’s technologies or even its political and social systems; that way spells disaster. But it must become creative again, as it was before. It must invent technologies and social systems that will save it from the disaster of just aping the West. They put the first nuclear-capable missile up in 1966. Their first astronaut went into space in 2003. They hosted their first Olympic Games in 2008. They have Beemers and condos, Internet access and cell phones. That is all western stuff; now take it a do something really creative with it, China. We would all become China lovers.